I saw this image on pinterest via Sincerely Jules, and since I couldn't find the cardigan source, I decided to just re-vamped my own. Read on for full instructions! 1) Measure out your fabric of choice in the lengths of your cardigan edges. 2) Cut strips along the edge of your fabric approximately 1/4-1/2 in. wide. 3) Using liquid stitch, slowly attach your strips along the edges of your cardigan and let dry. How do you think of these! What a great idea - I could def. try this one! That is like the perfect pop of neon! Thanks for another fab DIY Anna! Adorable!! That is just so stinkin' cute!! I love this idea!! I have quite a few cardi's that are classic but kind of...boring. This would be the perfect way to add in some flavor! Love this! Lord knows I love a cardigan. Also, I must openly confess that I coveted your sandals in the top pick. Cute! Love the cardigan "after" a lot. I think the raw edge of the fabric will look fun too. I have that same cardigan...it looks so great after the update, I think I'll need to doctor up my own!! Thanks for the awesome idea! You are too much, Anna! What a great and easy DIY! Love it! I keep wanting to try out all these ones you're posting....I guess I'm just going to have to set aside some Saturday to do them! You are soo talented! Seriously, love this look! Great idea. Anna, this turned out so well! I love. Simple = fab! Love this! You had me at "liquid stitch." Amazing. I absolutely love this Anna! What a fun way to incorporate some neon into your wardrobe. I'm going to try to find a cardigan I can do this with! Oh Anna this came out beautifully. Love that pop of neon. gosh. your so creative its INSANE! i love this! like REALLY LOVE. how cool! If you cut the fabric on the bias, it won't fray as much (some fabrics fray a lot cut on a straight line), plus it's easier to fit around curves for a smooth line. If you don't want to do that, add fray check to the ends so it doesn't fray! as always anna i'm amazed by your creativity. love this idea! Love! So fun and unexpected! That is DARLING! What a great little project. Anna I love it! What a great DIY. The pop of color is unexpected and perfect. Neon should be "subtle"! eeek!! this is soo stinking cute anna! love it! 2. 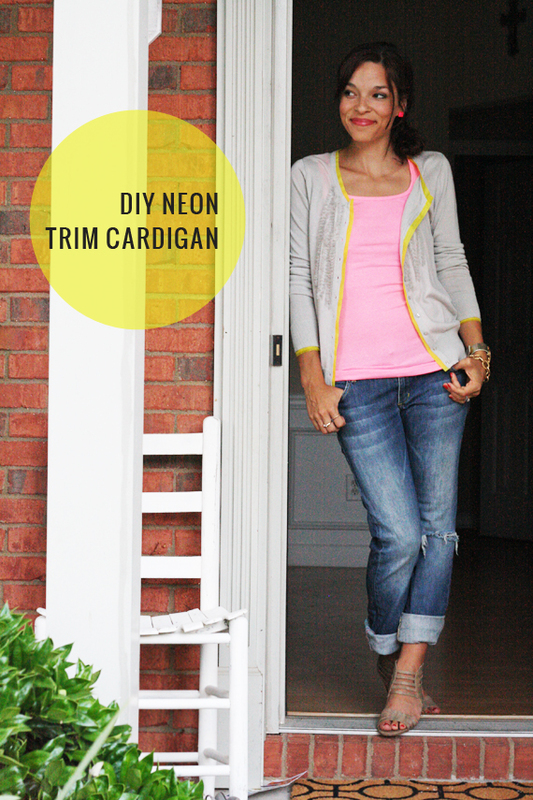 This is a brilliant way to revive a cardigan. Or maybe trim on a boring tee? I'm always inspired by your blog! I am definitely doing this!! Super cute DIY! Love the color you chose!